The R28, Renault's 2008 contender, was presented today at the team's communications headquarters in Boulogne-Billancourt, on the banks of the Seine in south-west Paris. Bellow you can find the technical specifications of the R28. Renault F1 Team and designed for maximum strength and stiffness with minimum weight. RS27 V8 engine installed as a fully-stressed member. Front suspension: Carbon fibre top and bottom wishbones operate an inboard rocker via a pushrod system. This is connected to a torsion bar and damper units which are mounted at the front of the monocoque. Zero-keel design for front suspension mounting in order to optimise front end aerodynamic performance. Transmission: Seven-speed semi-automatic titanium gearbox with one reverse gear. “Quickshift” system in operation to maximise speed of gearshifts. Braking system: Carbon discs and pads (Hitco); calipers by AP Racing. 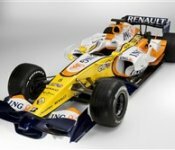 Identical specification RS27 engines will be supplied to the ING Renault F1 Team and to Red Bull Racing for the 2008 season.